When Camille Pissarro, Julie and their two children escaped from the Franco-Prussian war, they took shelter in London for several months, December 1870 through June 1871. 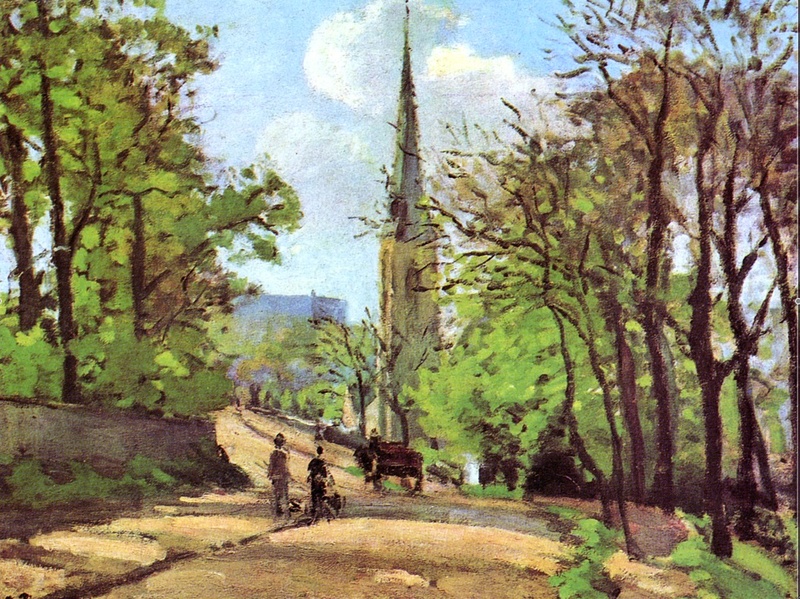 They finally settled in at Upper Norwood (a town in South London), and Pissarro began painting the streets and fields around his neighborhood. Saint Stephen’s Church, Dulwich (PDR 181) was painted during that visit to London. Although Pissarro signed and dated the picture “70” (1870), it must have been painted in the springtime of 1871. He did not arrive in London until December 1870, and he made other paintings showing a snowy winter, not the light green foliage of springtime in this picture. Pissarro set his easel on the side of College Road with the Sydenham Hill train station behind him. He made another painting from that same spot (PDR 190, undated), but for that one he turned to his right, looking across a field and distant hills. The foliage in that picture is also green and fresh like this one. Saint Stephen’s Church was a new building when Pissarro painted it. Built in 1867-68, it is a neo-gothic church with a free-standing tower topped by a spire covered in slate. That neighborhood had developed rapidly after the famous Crystal Palace (from the Great Exhibition of 1851) was moved to the area in 1834. (It was there until it burned to the ground in 1936.) 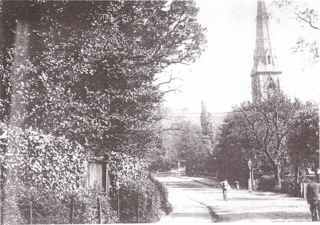 The church and College Road still look very much the same as they did then. 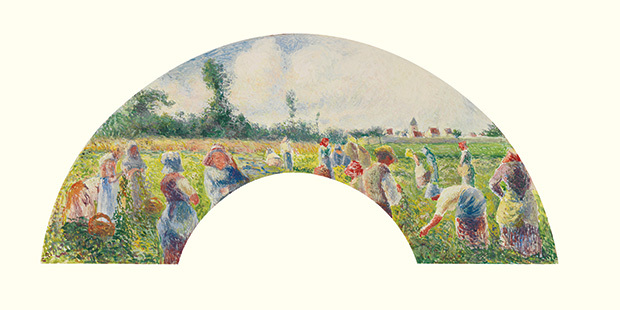 This painting is almost unique in Pissarro’s oeuvre because it has one indisputable focal point, an element that dominates the painting, and is placed exactly in the center of the canvas. Even so, it is not typical because the focal point is not in the foreground. It is of course, the tall church tower with its slate-covered steeple, thin and sharp as a needle, which almost pierces the top of the canvas. It is the one element we cannot ignore and our eyes cannot leave it. Just in case we don’t get the point (pun intended), Pissarro places a large buggy on the road just beneath it. Then he positions a man and woman walking toward it. The trees frame it on either side and the white clouds provide a backdrop. Although the road does curve, Pissarro gives it a sharp angle which leads our eyes to the base of the tower. Current photos suggest that Pissarro may have exaggerated the height of the tower just a bit, and the spire might be a little slimmer than in real life. The painting also conceals another landmark which we cannot recognize (perhaps a little of Pissarro’s keen sense of humor showing through). Just to the left of the tower is some sort of grey structure with no identifiable marks. Local historians who know every inch of their neighborhood’s history have identified that structure as none other than the famous Crystal Palace. Another famous person also visited that area for a few months in 1898-99. Émile Zola, who had been sentenced to prison in France for writing his famous letter “J’accuse,” escaped to London instead. He and Pissarro had been friends since they were both young men in Paris, and no doubt he knew the paintings Pissarro had made nearly 30 years earlier in Norwood. Zola, who was an amateur photographer, made a photograph of the exact spot where Pissarro had painted Saint Stephen’s Church. The tower of Crystal Palace in the background is easily identifiable in his photograph. Aside from the focal point, it is important to look at the light-colored palette, the fresh greens, the grey blue of the sky and the golden sunlight spilling across the road. It is a quintessential Impressionist painting and lovely beyond words. It’s no wonder St. Stephen’s Church uses it as their symbol on their website and other materials. The painting is in a private collection. For additional information on St. Stephen’s Church, the following websites are helpful. The gorgeous painting featured above is not included in PISSARRO’S PLACES. One of the criteria for that book is that all paintings be in museums or public places that are easily accessible to everyone. Paintings are most often rectangular or square, or even round. But how unusual is it to see a painting in the shape of a fan? These two, both in the Impressionist Auction at Sotheby’s in May, are superb examples of Pissarro’s fans. Before the time of air conditioning, a folding fan was an important accessory for a lady. She could use it to generate a pleasant breeze or to flirt with a stranger. In the 17th and 18th century, fans were decorated with ornate patterns and designs, becoming works of art in their own right. Instead of cutting and folding them to fit the frame of the fan, they were sometimes left flat and framed like paintings. Among the Impressionists, both Pissarro and Degas made paintings in the shape of fans. Unlike earlier fancy designs, their fans were complete paintings made to fit in the unusual circular shape missing a center. It is interesting to see how Pissarro placed each of the elements to fit within this odd shape. In the fourth Impressionist exhibition, Pissarro exhibited twelve fans, and he continued making fans throughout the 1880s. 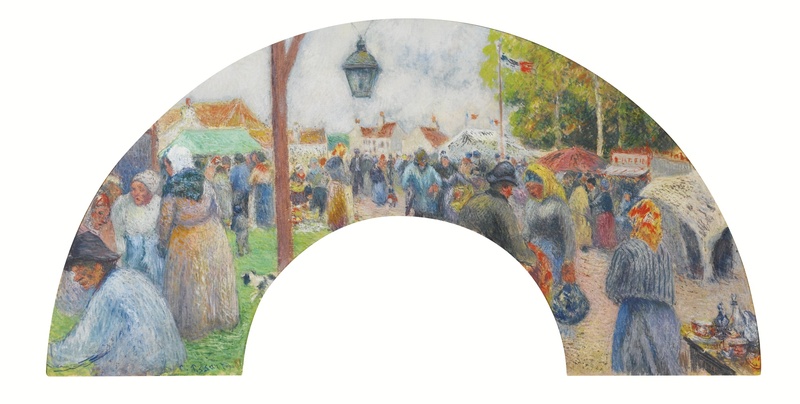 The first fan shows a busy market scene, very typical of Pissarro’s work, except it fits perfectly into the odd shape. He uses the lamp-post on the left and the flag pole on the right to divide the space into thirds. On the left, we see the vendors up close, going back and forth to the stalls. In the center, a view of the village in the background and on the right, a woman beside a table filled with china or glass objects for sale. The composition is so perfect that the “hole in the center” is not even noticed. The second fan, showing women in a field picking peas or beans, is a very special one indeed. This one belonged to Mary Cassatt, who obtained it directly from Pissarro. He uses a different device in this fan, creating a very strong horizon line which causes us to assume that there is a line across the bottom too. Again, the figures on each side are shown close up and those in the center are farther away. He balances the distant village in the right background with the tall trees on the left. Since fans were most often painted on paper or silk, they are more sensitive to light and are not often put on view in museums. Occasionally, fans will be shown in special exhibitions. So it was a rare opportunity to see these two, both of them superb examples of Pissarro’s artistry. 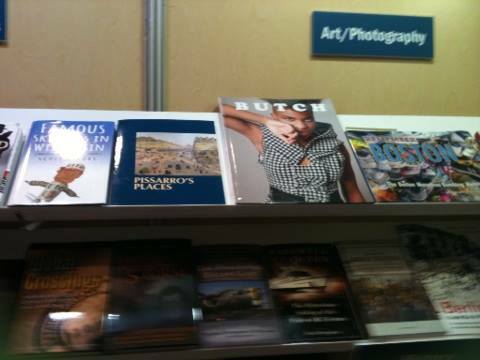 Book Expo America in New York last week. This photo shows it on the top shelf in the center. The special discount on purchase of the book is still available to those who visit the website.